Great Pass well done Dan! 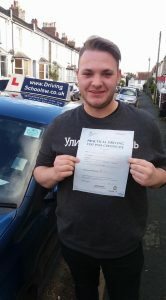 What a result………First time pass for Dan who has been having Driving Lessons in Torquay with The Driving School sw.
Dan passed his Driving Test with just 5 driver faults, a great effort considering the frustrations of the Theory Test. Dan’s Driving Instructor Darren who works for The Driving School sw said “congratulations and a big well done, stay safe on the road”.